Here at Intel's big CES keynote, CEO Brian Krzanich is announcing Intel's new Curie Module, a tiny little device that will let you turn all the things you already own and wear into smart devices. It's a little button-sized hardware module, powered by Intel's teeny tiny Quark technology, and it adds a brain to anything you attach it to. Intel started down this road with its stamp-sized 22nm Edison SoC and the Curie module shrinks it down even further. The module uses Bluetooth LE and has a built-in accelerometer and gyroscope to track movements and recognize gestures. It can run either off a rechargeable battery or a more traditional coin-like watch battery, though Intel doesn't say for exactly how long. Curie basically turns just about anything into a gadget that's at least as smart as your average fitness tracker. Rings, buttons, glasses, watches, whathave you. It's not something you would go around attaching to your glasses and your watch yourself, but rather a sort of a bolt-on solution for companies that want to makes simple wearables. Instead of developing their own solutions, they can use Curie as a building block and cram in a pre-programmed brain. 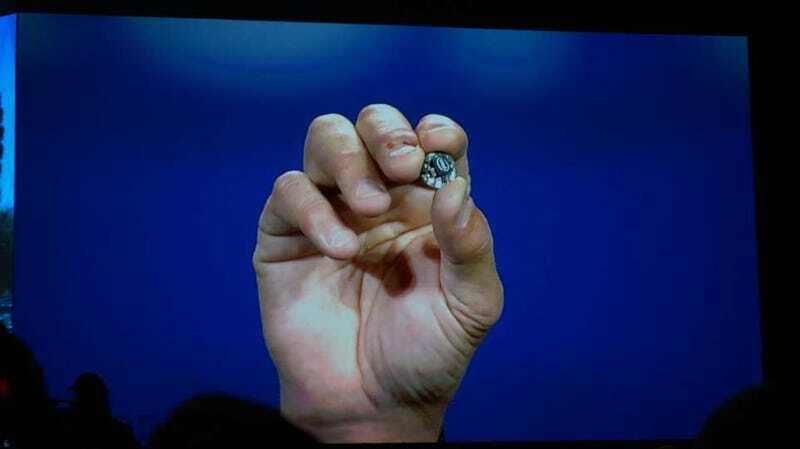 Intel plans to start shipping these modules later this year. Welcome to Gizmodo's coverage of all things CES 2015! For our comprehensive rundown of everything new and shiny at the year's biggest gadgetorium, check out our pop-up site here. blOgton USa is stil fien tho rite? yeaah? pls?